2015 Road Trip Photos #11: Lights of Birmingham « Midlife Crisis Crossover! 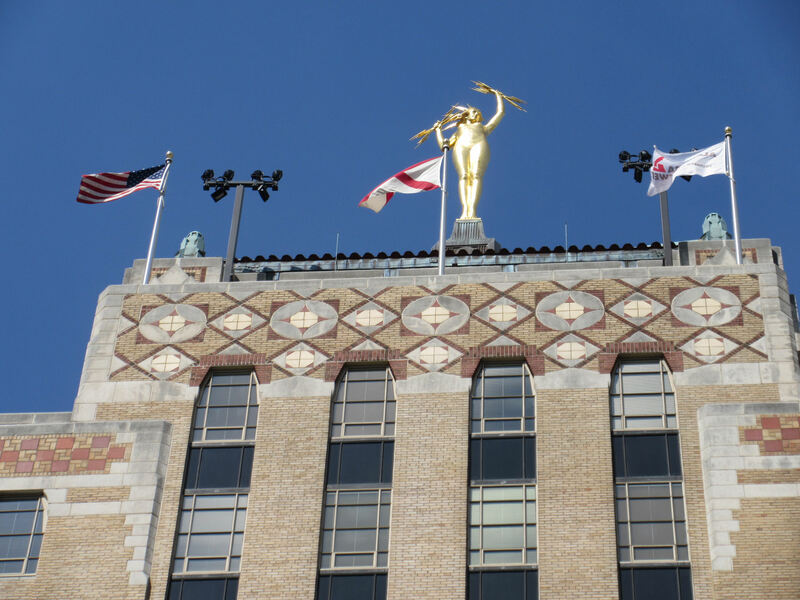 “Electra” has stood atop the Alabama Power Building downtown since 1926. Her origins lie closer to Greek mythology than to any similarly named Marvel characters. Our two-hour walk around downtown Birmingham on a Sunday morning took us from Kelly Ingram Park to Linn Park to the Art Museum and to other parts here and there. We also stopped at their bus station because Anne had it good authority that they had one of those smashed-penny machines. I don’t mention those often in our travelogues, but those are a big, BIG thing for her. You’d be surprised how many of our stops over the years appeared on her smashed-penny machine master list months before they appeared on our finalized itineraries. This time, though, either her informant was misinformed or the bus station management hid it in some far-off back room. We weren’t prepared to go that deeply into the heart of bleakness. 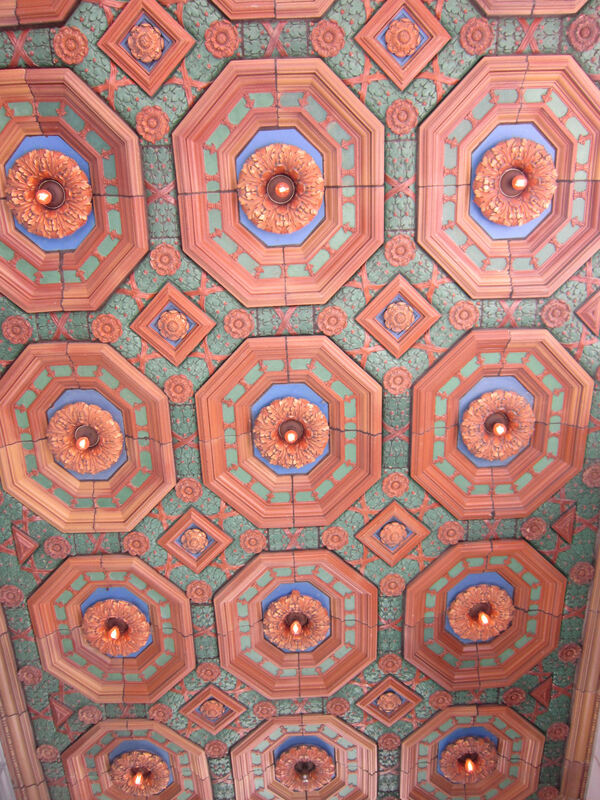 We took zero photographs of the bus station, but other curiosities caught our eye as we traipsed around town. Electra up there, for example. Anne and I held a zoom-off with our respective cameras. This was her least worst effort. It’s hard to tell from our vantage twenty stories below her, but Electra stands twenty-three feet tall and weighs two tons. 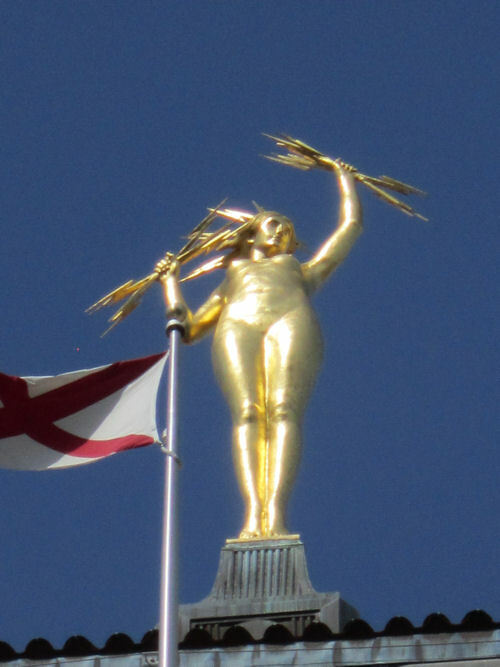 She’s bronze on the inside, gold leaf on the outside. She has another, taller, special Roman friend who stands elsewhere in town, but we’ll get to him in Part 12. Yay architecture! 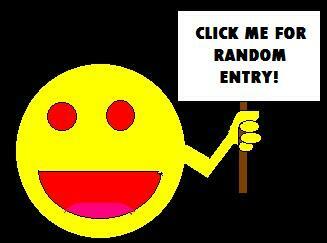 Or exterior decorators! Whichever! 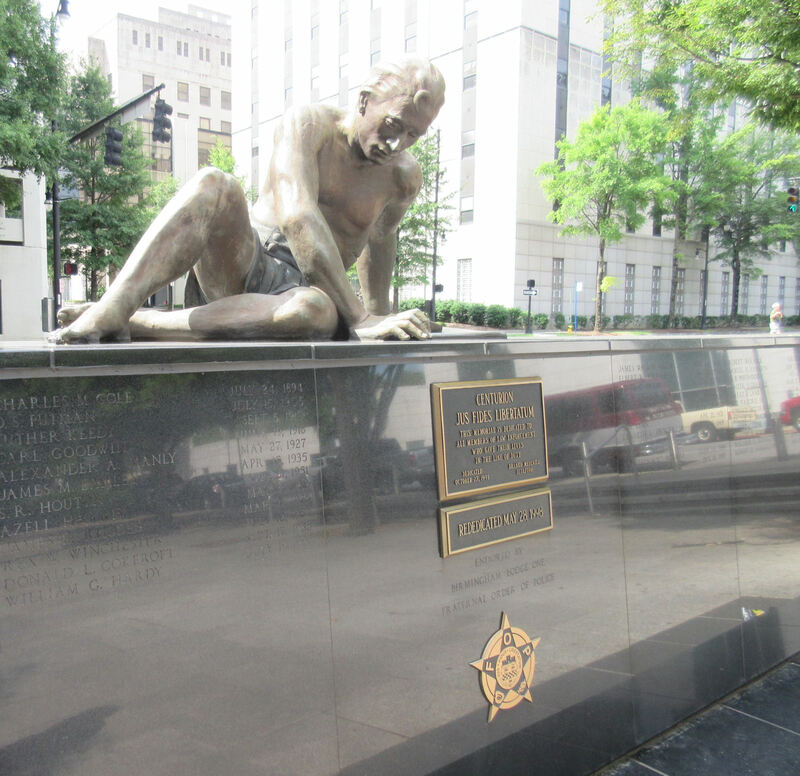 Not too far from the other sights was “Centurion: Jus Fides Libertatum”, a memorial to the fallen policemen of Jefferson County, design likewise influenced by Greco-Roman history. The Latin subtitle means “Law is a safeguard of freedom”. 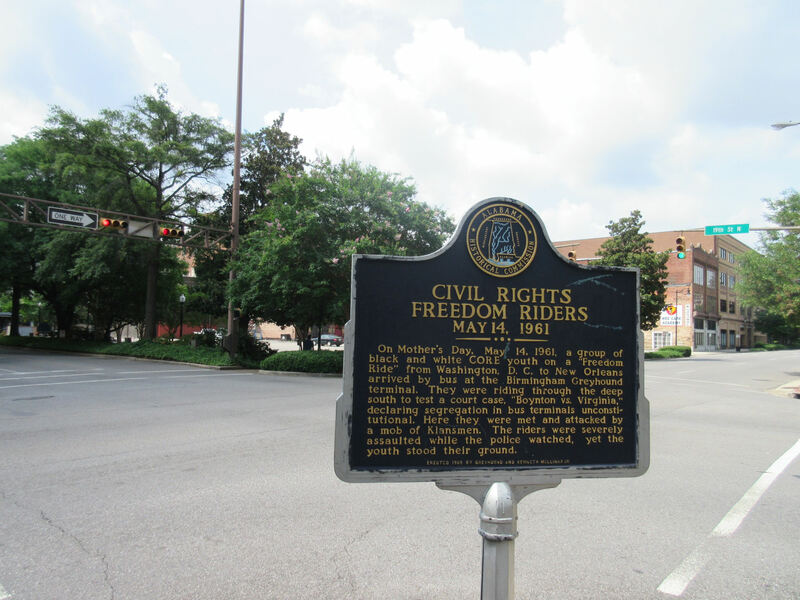 This “Freedom Riders” marker is a bit far from Kelly Ingram Park, but sadly relevant to the history commemorated on that city block. Sadly, closed Sundays, ‘twould seem. 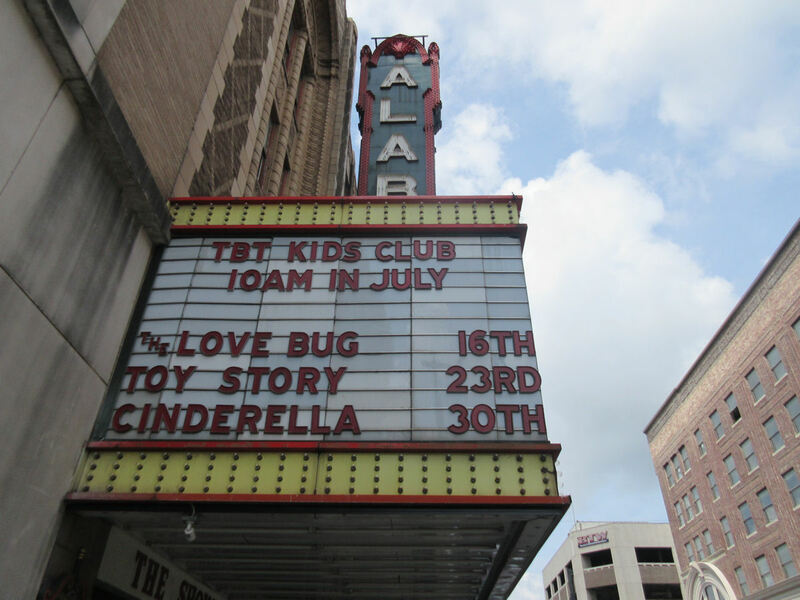 Also during the summer: kiddie movie marathons! Longtime MCC readers may or may not recall I have this weird thing about seeking old marquees in the towns we visit, but I’m always glad to find one on a theater still teeming with life and community interaction. I brought along To Kill a Mockingbird as my summer reading for the week. 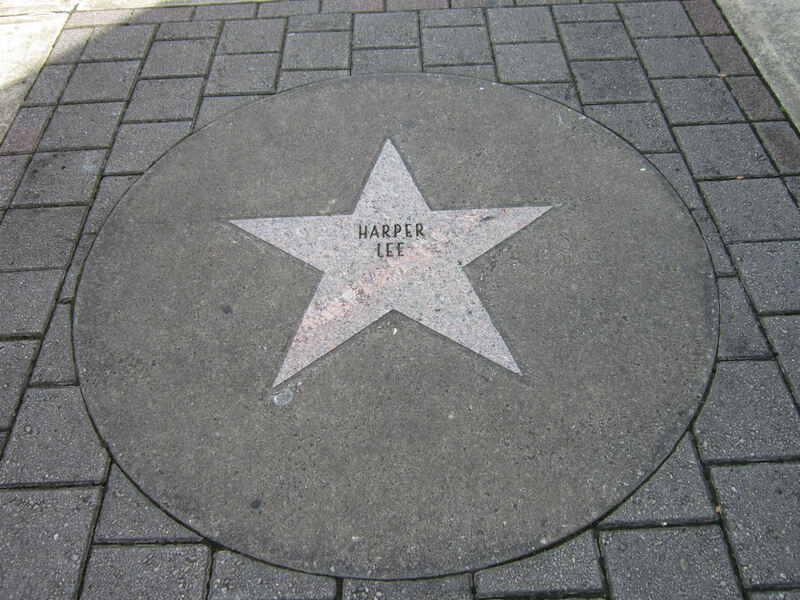 This won’t be the last time you see Harper Lee’s name in this MCC series. 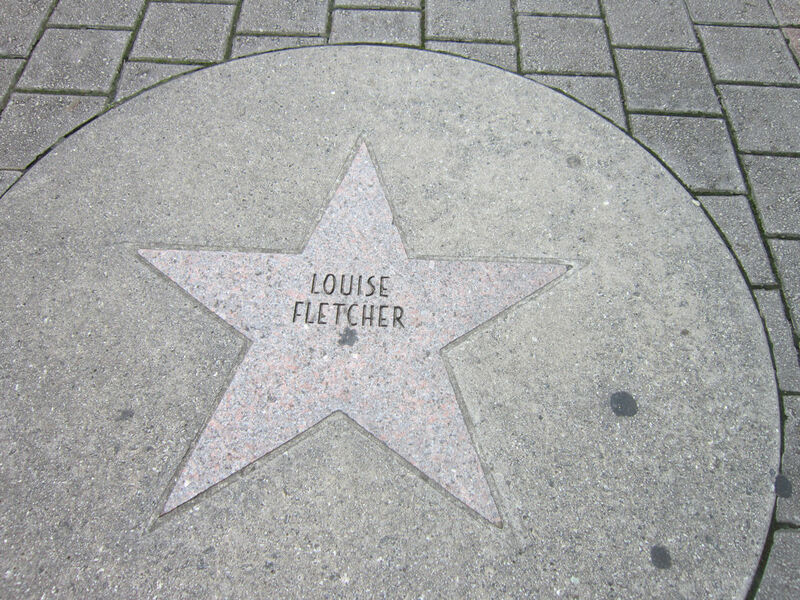 Academy Award Winner Louise Fletcher, born in Birmingham, is best known as the infamous Nurse Ratched from One Flew Over the Cuckoo’s Nest, but to Anne and me she’ll always be the much more sinister Kai Winn from Star Trek: Deep Space Nine. 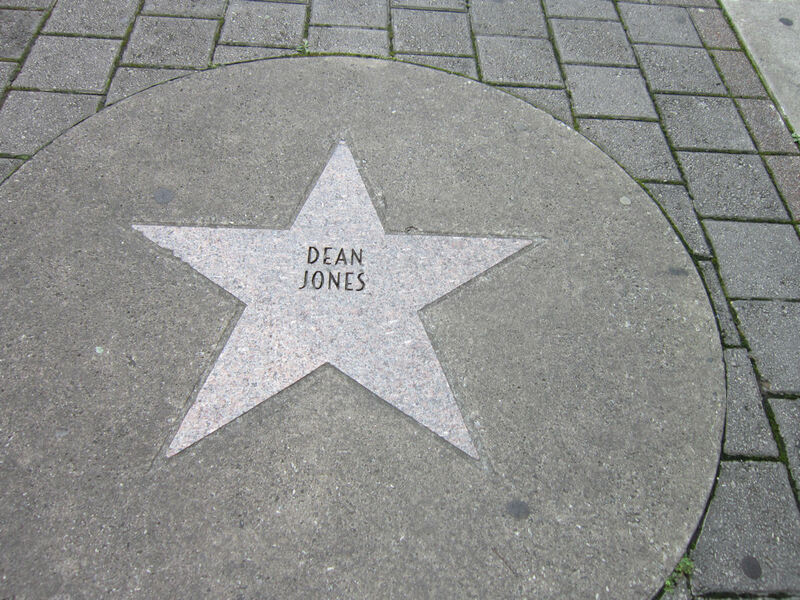 Decatur native Dean Jones (The Shaggy D.A., the afore-pictured Love Bug series) was a Disney live-action leading man back in the ’60s and just passed away on September 1st. Odd timing on this. Across the street is the Lyric Theatre, which predates the Alabama with a vaudeville history going all the way back to 1914. It’s been dormant since the ’70s, but was bought in 1993 by the same company that owns and resurrected the Alabama. 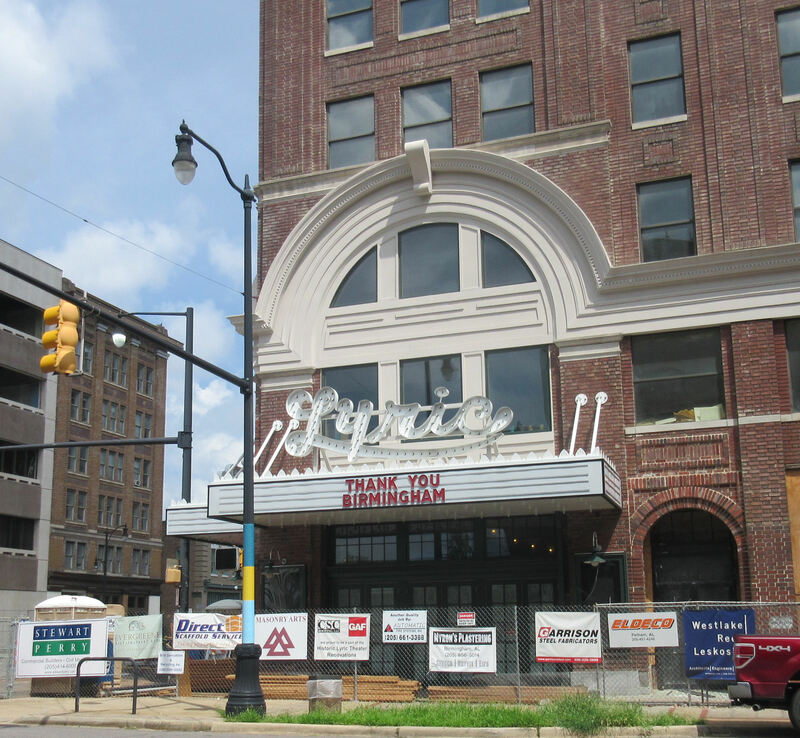 Fundraising efforts continue for a years-in-the-making restoration process in hopes that Third Avenue might someday have twice the cultural venues bringing big names and great art to Birmingham. 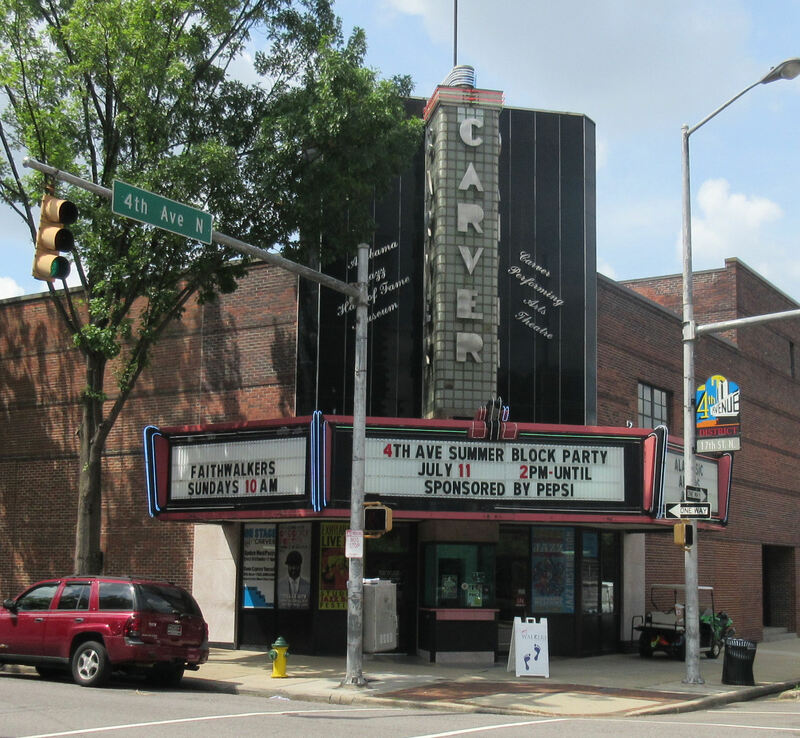 A few blocks west-ish stands yet another marquee at the Carver Theatre, home of the Alabama Jazz Hall of Fame. 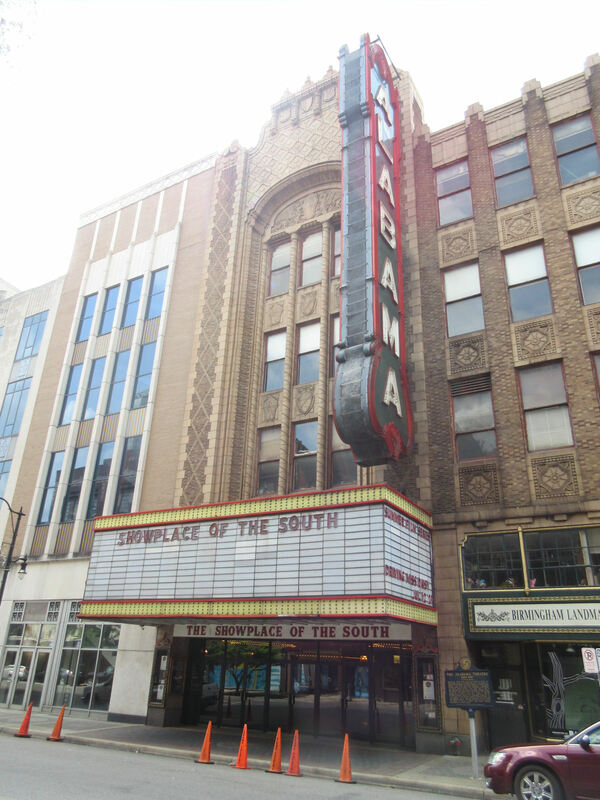 Once it served as a first-run theater for the black community in the ’60s; today it’s a jazz venue and, judging by the lively melodies emanating from it as we passed by, holds some spectacular Sunday church services. These spots were the brightest spots on the back half of our self-guided tour. I’m sorry we missed a lot of interiors and spending opportunities visiting at such an inopportune time, but our Day Two schedule was tighter than these past several entries would suggest. We had two more stops planned in town, then two more states to drive through before sunset, Lord willing. 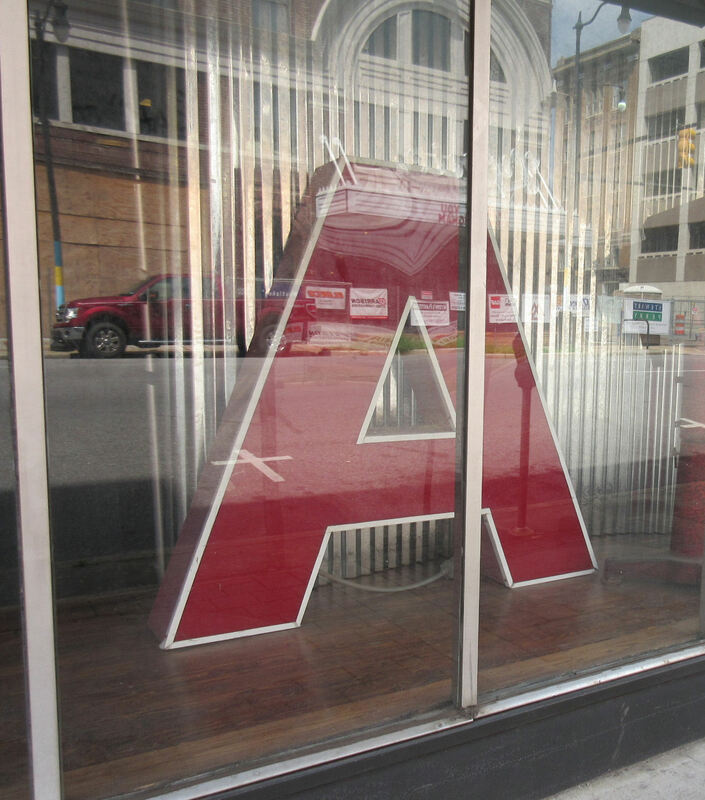 On display in the window of the Alabama is one of their former marquee A’s. Objects above us are larger than they appear, apparently. Or maybe this is their TripAdvisor rating and they’re really proud of it.